The green substance may occur in old wires with PVC insulation. This problem has been reported and analyzed in the commercial nuclear industry. Industry studies indicate that the formation of the substance does not significantly degrade the current carrying capability of the wire or insulating capability of the insulation. The main concern with the substance is dripping onto electric contacts. green substance should be monitored and cleaned during normal electrical maintenance or housekeeping. The reaction can also cause embrittlement of the insulation. If this occurs, the wire should be replaced. A green substance coming from old electrical cables can cause problems with electrical components by preventing operation of contacts. On June 14, 1995, a mechanic at WSRC noticed a green substance coming out of various electrical cables in a panel. Sufficient liquid had formed in one location to produce a green trail on the back of the panel. The WSRC Senior Electrical Review Board (SERB) coordinated a joint WSRC/DOE investigation with chemical analyses performed by commercial industry vendors. At one nuclear power plant, a non-safety related overcurrent protective relay failed to operate during routine testing. The relay failed because this substance had coated the electrical contacts of an instantaneous trip unit and prevented the relay from operating. Following the initial discovery, 120 pieces of electrical, lighting, and control equipment were inspected. Six components had various amounts of the green substance ranging from single drops to small puddles. Most of the affected wires were 20 to 30 years old with black PVC insulation on #14 wire. Samples were sent to two offsite vendors for detailed analysis. The independent analyses of these samples concluded that the green substance developed from reactions between polymeric plasticizers in the insulation and the copper in the wire. The plasticizer is used to make the insulation more flexible. The reaction produces a green substance that is chemically incompatible with the insulation and is exuded from the wire. This green substance can be either an insulator or a conductor, depending on the chemical reactions involved. Either case can cause serious safety hazards. The substance can drip into components and interfere with their operation. In addition, loss of the plasticizer can lead to embrittlement of the insulation. - Electrical panels and components should be inspected for this phenomenon during routine inspections or during normal preventive or corrective maintenance. Safety related panels should receive the highest priority and the most detailed inspections. - If this substance is found, an evaluation of the electrical impact, focused on the following questions, must be completed. If the answer to any of these questions is “yes”, then the wire must be replaced. * Can the substance drip onto contacts or terminals? * Is the substance flowing in such a way as to cause a short circuit? * Does the insulation show sign of embrittlement? For those cases where the substance can cause either a personnel safety problem (i.e., slipping hazard) or an operational problem with electrical components, the wire should be replaced as soon as possible. Another possible corrective action would be to reroute the wire so that it does not allow the substance to drip onto an electrical component. 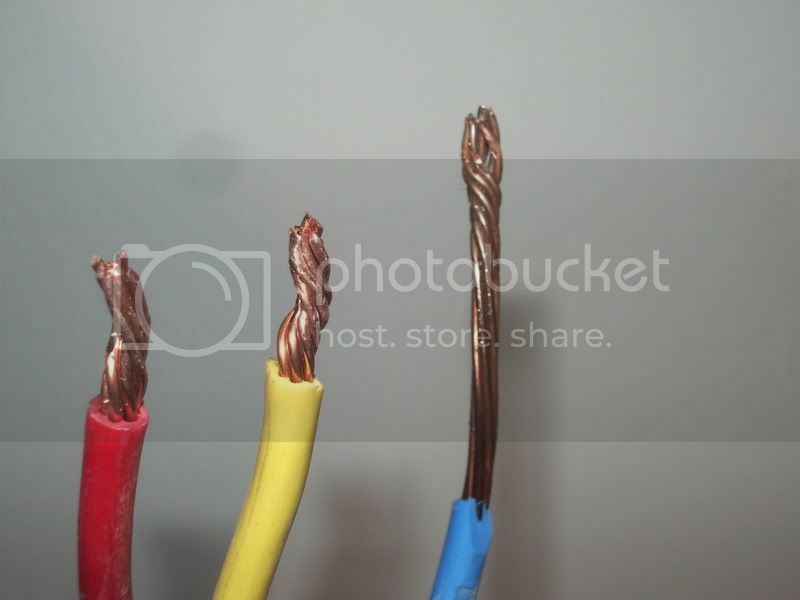 In cases where wire embrittlement is present, the wire should be replaced. If the green substance is found and there is no electrical danger, the substance should be removed by cleaning. Proper hazardous energy control methods must be followed when performing cleanup of this substance. 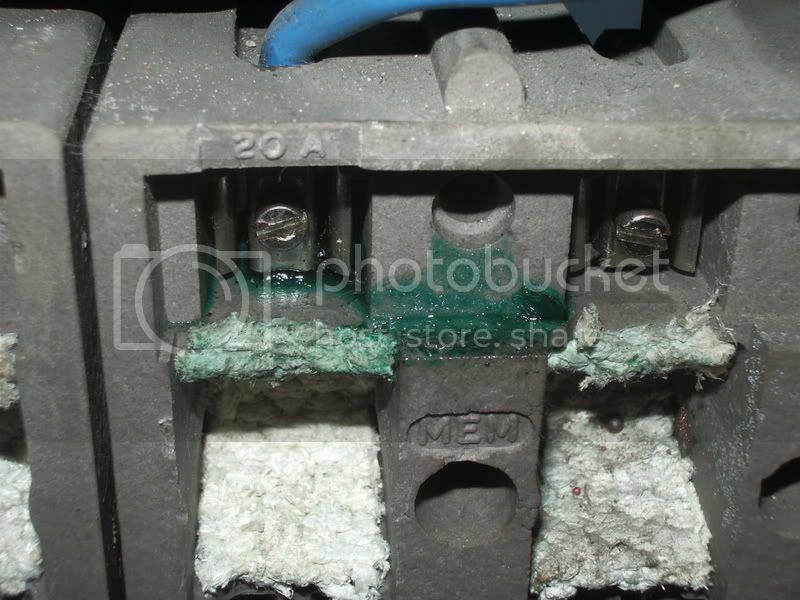 The SERB, with Industrial Hygiene (IH) concurrence, recommended using Safezone Cleaner MS-260 and Kim-Wipes (a lint free cloth) to remove this substance in 232-H. Clean-up inside an electrical panel or around energized components requires use of the necessary hazardous energy control methods (i.e., de-energize, lockout, and tagout). The pic was taken on the side of the unfused spur that was in a conservatory (the other side was not as green) and had been installed for around 12 years (DIY old cable re-use job) so had been subjected to a lot of heat during the summer hence the volume of ‘fairy liquid’ that had acumulated in a relatively short time. The slime may be something to do with the chemicals used to colour the cable, as only the blue insulation has been affected in this cable. The slime has started to migrate to an adjacent terminal, which may have caused problems with the installation.